As your child continues to grow it is highly important that their toys encourage creativity and imagination. A dollhouse will do exactly that while also allowing your child to role-play. Through role-play, your little one will develop their emotional, cognitive, and social skills. The ten dollhouses below come in all shapes and sizes but are bound to provide countless hours of entertainment for your child. Straight from the hit movie Frozen, it’s Elsa’s beautiful Ice Castle! Comes with everything a budding Queen needs to rule her kingdom like a vanity, a piano, a bed, a lounging couch for relaxation, and, of course, a throne! Made for larger dolls, and perfectly fits Barbies and the Elsa doll! Built with Plexiglas windows, sturdy composite wood, and molded plastic for a lifelong dollhouse. Comes with a detailed step-by-step instruction manual for an easy, frustration free construction. Our brand new format allows you to look at the best dollhouses on the market and compare the specific criteria most buyers use to assess their purchases. A numerical rating system makes it easier to see the strengths and weaknesses of each and every product. For this update, we focused on removing out of stock products. We also narrowed our list to include only the most popular and well-reviewed products currently available. Includes small parts, so this toy and it’s pieces should be kept away from small children. This toy is compatible with the Elsa, Anna, and all the other Frozen dolls! Watch your child recreate their favorite story with the Frozen Ice Castle! 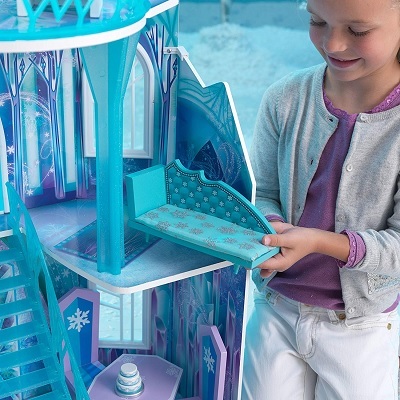 Standing almost 4 feet tall, the Disney Frozen ice Castle Dollhouse is a marvel to behold. 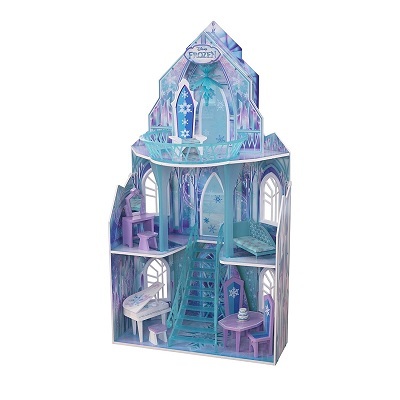 Your girl will love putting her Princess Elsa figurine or any Barbie doll for that matter in this beautiful icy doll house. 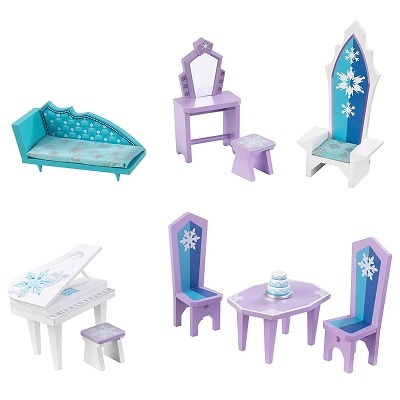 It features 11 highly detailed pieces of furniture including a chandelier, a grand piano, and a gorgeous ice throne. 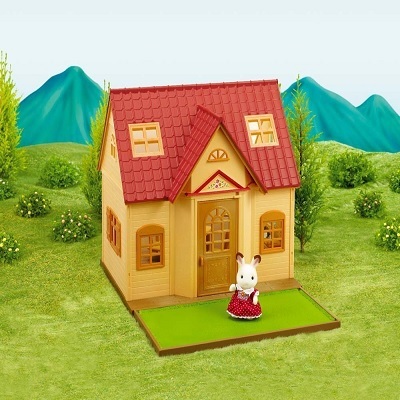 The dollhouse is made of safe molded plastic and high-grade composite wood materials. 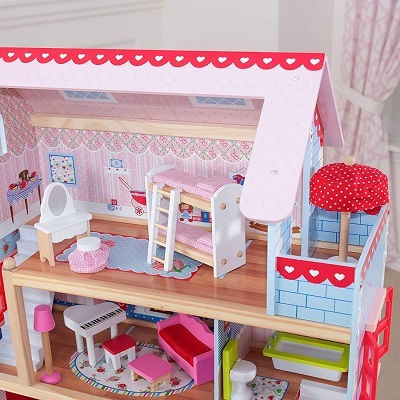 The beautiful design of the dollhouse is something that you would want to display in your kid’s bedroom. 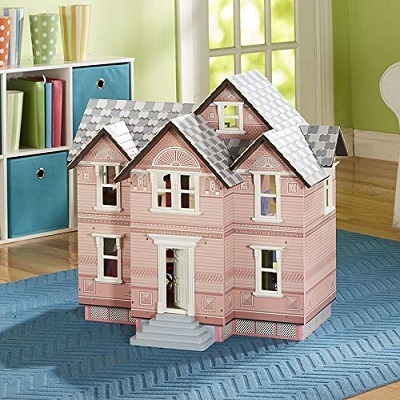 This dollhouse is excellent for make-believe play as well as stimulating your kid’s cognitive and motor skills. What little girl isn’t obsessed with Frozen? 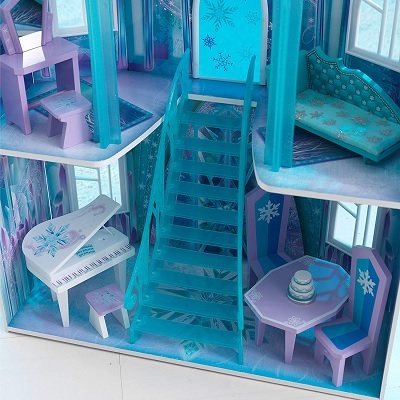 We think this dollhouse is perfect for our little ice queens because Elsa is such an iconic character that many children can relate to in society today. And because your child is most likely already acquainted with Elsa, they will be immediately drawn to this dollhouse. 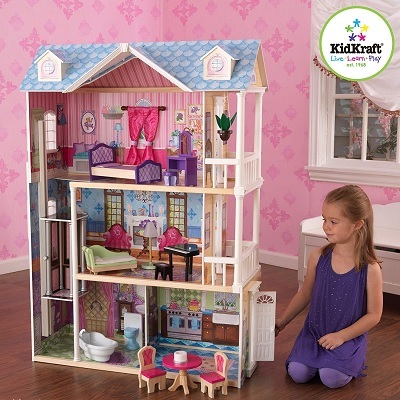 The KidKraft Majestic Mansion is perfect for children with large rooms and even larger imaginations. Designed with four stories and eight different rooms, this dollhouse comes out to four and a half feet tall. The included thirty-four pieces of furniture can be moved from room to room to allow your child to decorate the house as they please. The extra wide windows on each side make it easy for your little one to see their dolls from several different angles. The yellow color of the outside walls will easily blend with any decor in your child’s room. The open design and large quantity of rooms make it possible for your child to share this dollhouse with their friends and family. Equipped with movable features like a working elevator and garage doors that open and close, the opportunities for imaginative play are endless. 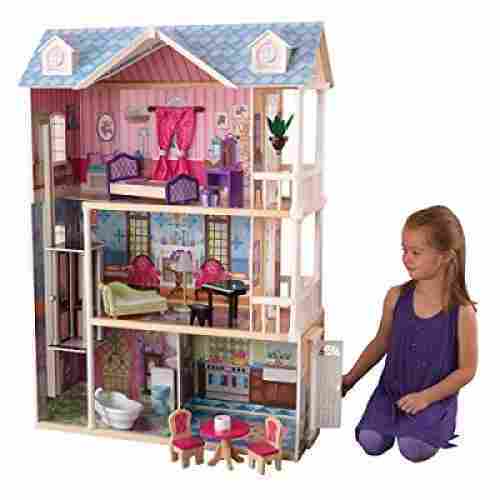 Your child will be able to enjoy this dollhouse as they grow due to the durability provided by its wood composition. With eight different rooms, four stories, and a variety of workable features majestic is the perfect name for this dollhouse. The large space makes it great for several children to enjoy at once. This product is a highly artistic and loveable recreation of one of your daughter’s favorite Disney films. The set includes a lavish variety of artwork and decor, even including a bendable Lumiere figurine. If you have a daughter in the home, then you almost certainly have a keen lover of the classic Disney film Beauty and the Beast. 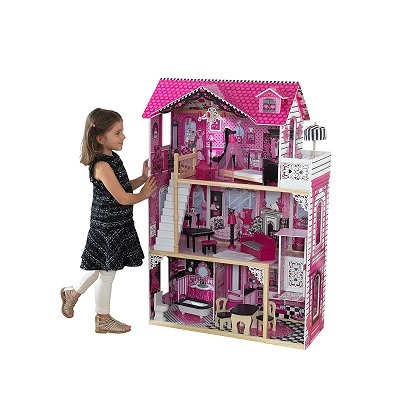 This product from KidKraft has been custom made for that love, giving your daughter a beautiful three-story mansion of a dollhouse to play out one of her favorite films. Give your daughter the Disney experience, giving her a spacious place to play out her fantasies alone, or with friends. This set will be a favorite of hers for years to come. 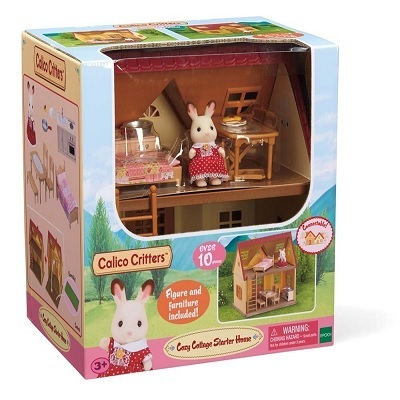 Can be used with other Calico Critter homes to create a complete town full of the Calico Critters! Includes some small pieces, so please keep out of reach of young children. This dollhouse is adorable! And that’s partly what makes this dollhouse so amazing. 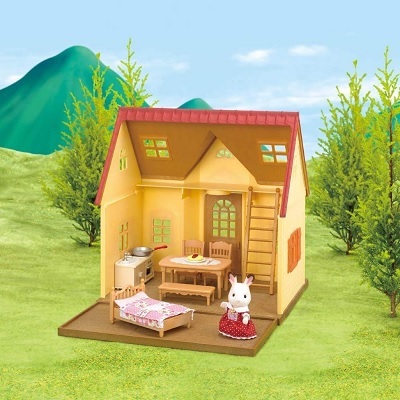 With a very simple cottage design, the Cozy Cottage Starter Home is ideal for young kids. 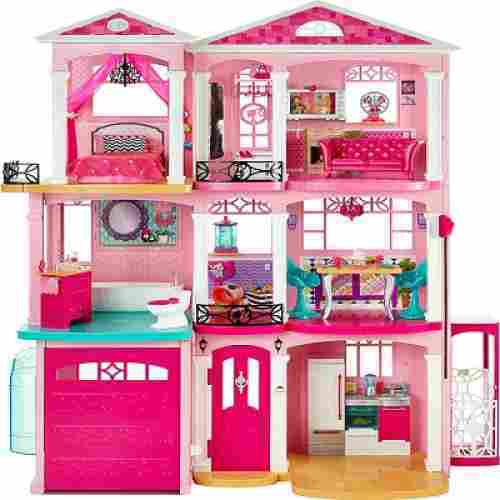 The play set comes with 15 pieces of furniture and accessories that can be conveniently placed anywhere in the two-story house. The 2nd floor can also be removed for a more spacious interior. It already comes with a Calico Critter figure. Girls will love the versatility of the starter home. This is fantastic for the stimulation of imaginative play. The dollhouse also can be expanded, allowing your kid to fully explore the possibilities. The aesthetic is inviting, but also cohesive with the rest of the Calico Critter houses. In fact, the houses can all connect together to form a cute little town for hours of play time and fun! The overall structure is huge and makes it very easy for multiple children to play all at once. Assembly is very easy and uses simple step-by-step instructions for immediate play time. The Dreamy Dollhouse is great for a number of dolls, including Barbie dolls and other large figures. Includes 14 furniture pieces and a gliding elevator for interactive and engaging playtime. Also includes sound and technical features such as a playing piano, a flushing toilet, and a light up lamp. Though the instructions are compressive and step-by-step, there are a lot of pieces that require assembly. 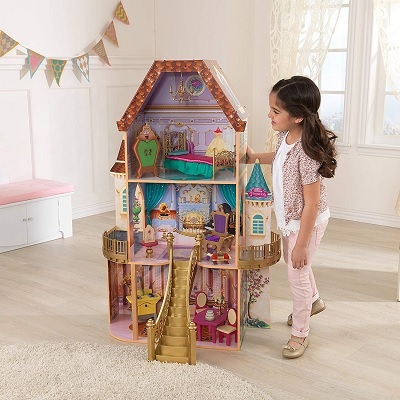 Measuring nearly 4 feet tall, the My Dreamy Dollhouse looks more like a toned-down version of a multi-layered cabinet that is adorned with beautiful pieces of furniture. It features three floors accessed not by a staircase but by a gliding elevator. It boasts of 14 pieces of elegantly designed furniture such as a grand piano that can actually play music and a toilet bowl that elicits the sound of a flushing toilet. Lamps equally light up to provide your young girl something to be proud of every time she plays with the My Dreamy Dollhouse. Not only is this dollhouse huge, but it comes with sound effects and light up lamps! 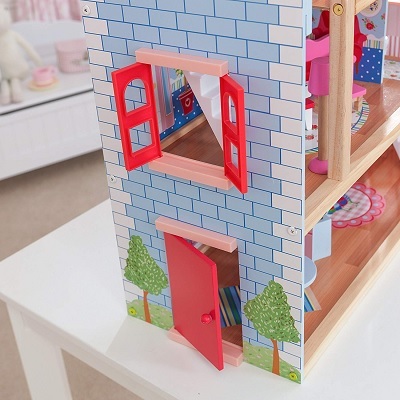 We love features like this because they immerse the child in their playtime and they help bring the dollhouse to life. This immersion is beneficial for the child because they’re able to drift away with their imagination and play to their heart’s content. Sounds and lights not only engage the child imaginatively but they also peek the child’s auditory and visual interest. This assures that the child won’t grow bored of the dollhouse, but, in fact, play with it for years to come. 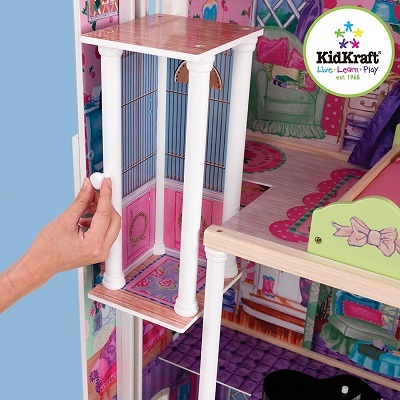 The doll house can be an excellent addition to the pieces of furniture in your daughter’s bedroom. It’s large enough to allow for simultaneous cooperative play. Wooden doll house is a great alternative to the plastic ones that we currently see a lot on the market. The details in the wood scroll work are amazing and the hands painted features give it a touch that just makes it feel personal. 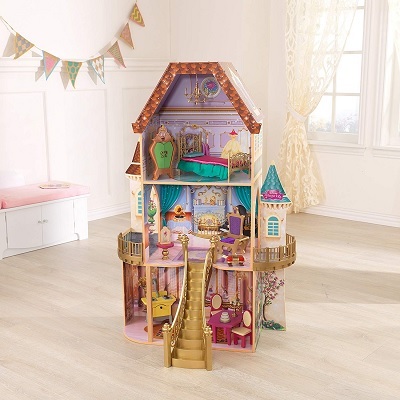 With the Kidkraft Belle Enchanted Dollhouse, your child can experience the Magic of Disney from their bedroom. Inspired by the Beauty and the Beast, this dollhouse is designed to resemble the Beast’s castle. This three-story open mansion includes 13 pieces of furniture and rich artwork on the walls that come straight from the movie. Amongst the furniture pieces that are included, there are a few characters from the movie. Your little one can enjoy playing with Lumiere, the footstool, and the wardrobe along with any other doll under 12 inches that they own. With three open stories, there is plenty of space for multiple children to play. 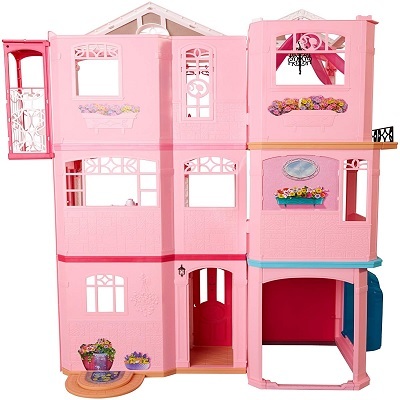 The castle is nearly four feet high, thus your little one can easily reach every floor. 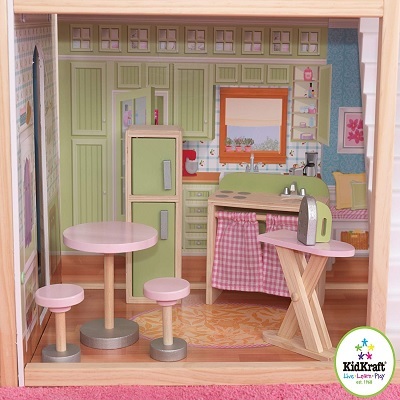 The attention to detail in every aspect of this dollhouse will further enhance your child’s imaginative play. 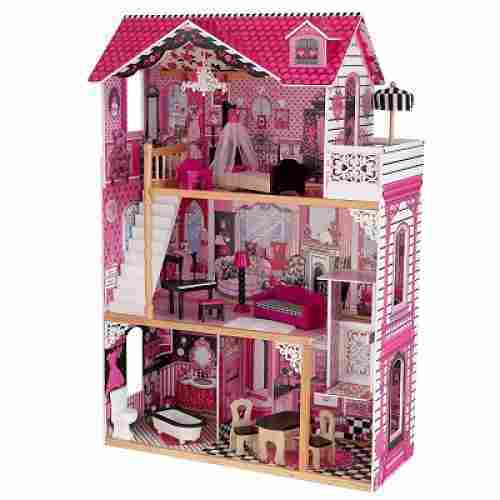 The dollhouse is very sturdy, thus you won’t have to worry about it tipping over on your child while they are playing. Three stories of beautifully designed, open space for hours of fun. Comes with 17 pieces of furniture to furnish the living room, bedroom, kitchen, and game room. Since it stands at over two feet, multiple children are able to play and fun together without feeling cramped. Includes fun features like windows that open and close, two movable staircases, and a fun patio for outdoor adventure. Perfect for dolls measuring four inches in length or smaller. This dollhouse does not come pre-assembled. 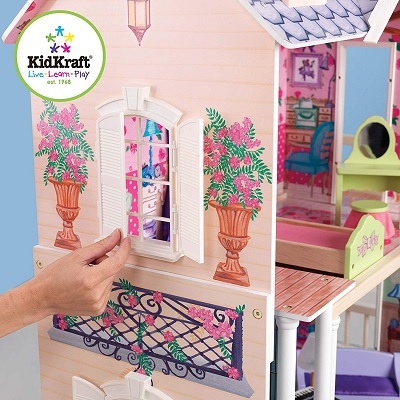 The colorful dollhouse from KidKraft will surely keep your little one busy all day long. What we find super beneficial about the Chelsea Doll Cottage is the versatility and movability of the furniture and structure. The Chelsea Doll Cottage comes with three levels with beautiful pieces of dollhouse furniture, 17 in all. The dollhouse is large enough to allow for multiple kids playing it all at the same time. It comes with a pink rooftop, light blue walls, and beautifully adorned windows that can be opened and shut. What we find super beneficial about the Chelsea Doll Cottage is the versatility and movability of the furniture and structure. Not only are both the staircases movable, but the entire floors are as well. This gives your child a creative license over the doll cottage itself and allows them to truly create something unique. And because none of the furniture is glued down, your child can decorate and re-organize rooms for interactive and engaging play time. It is large enough to make for a perfect play set for your young girl and her friends. It is great for stimulating your kid’s imaginative play. My Dreamy Dollhouse takes playing house to the next level. This four-foot dollhouse features three stories, four rooms, two balconies, and a gliding elevator. Your child’s twelve-inch dolls will enjoy the grand piano that plays music, the toilet with real flushing sounds, and the other fourteen included accessories. The beautifully decorated rooms will make your child feel like royalty as they play. Composed of wood, this dollhouse is highly durable and designed to survive as your child continues to grow. The included step-by-step instructions make the assembly process quick and easy so your child can begin enjoying the dollhouse in no time. The working features of the dollhouse will encourage your child to fully immerse into pretend play. The open design and multiple rooms make it easy for several children to enjoy the dollhouse at once. 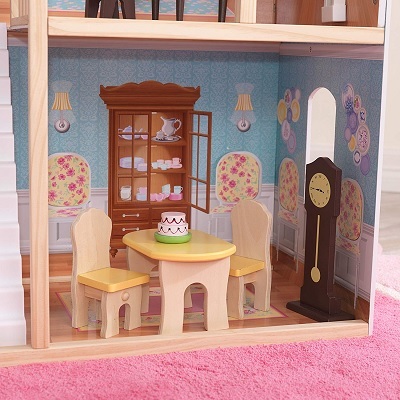 The wood composition not only gives this dollhouse an elegant feel but it also gives it a high level of durability which will allow your child to enjoy it for years to come. Made of handcrafted wood for a sturdy build and charming aesthetic. Victorian style detailing in the hand painted finishes and wooden accents such as the staircases, shingles, and window frames. Each room is decorated with beautiful graphics to emulate a real, sophisticated home. Very easy to assemble with a universal screw and comprehensive instructions. Built on a 1:12 scale, so many accessories from multiple brands and stores should fit beautifully, including sets from Melissa and Doug. This dollhouse does not come with any furniture or dolls. All those products are sold separately. 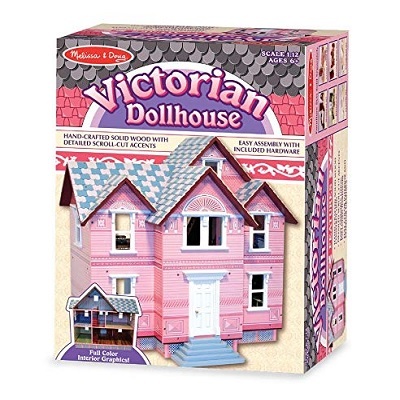 If your little girl has 5-inch tall dolls, then you should get the Classic Heirloom Victorian Doll House by Melissa & Doug as it has a scale of 1:12to the real house. 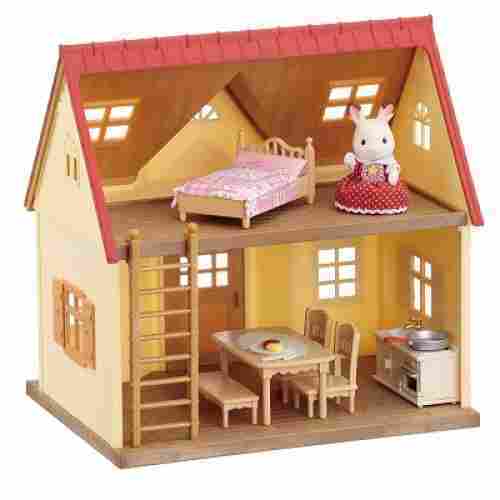 The doll house is made of high grade wood giving it durability which your kid can pass down on to her own children. It’s quite easy to assemble, too. Don’t let the picture of this beautifully crafted dollhouse on the front of the box intimidate you. The included step-by-step instructions make it super easy to assemble. Being composed of wood, this dollhouse is both sturdy and durable. The detailed graphics of each room and the realistic features are sure to foster a love of interior design in your child. It is composed of 2 full floors of wonderfully designed rooms plus an attic that doubles as a nursery or kid’s room. The lower floor is for the living room and the kitchen while the upper floor houses the bedroom and the toilet and bathroom. The roof shingles had been hand-painted and the accents, scroll-cut. With very ornate window frames as well as wood-styled elegant staircases, this is something that your kid and their friends will surely never tire playing with. Your kids and their dolls will feel right at home in this dream house. In the house, dolls will find three floors that have over seven rooms to play within. A working elevator allows the kids to take dolls from floor to floor to explore and play the dream house. There is even a garage to store their cars with a working door that opens and closes. In the garage, there is a window that is large allowing dolls and their playmates to relax while pretending to view the neighborhood or even watch a sunset. The best part is that the window then converts into a swimming pool for the dolls. 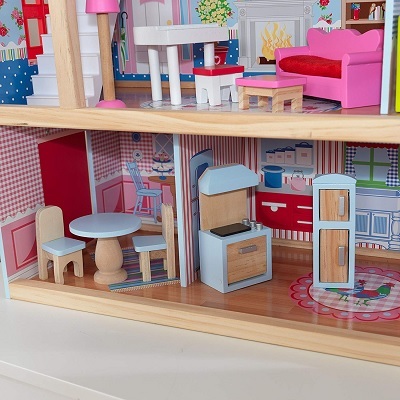 This doll house has a classic design with many modern upgraded touches. 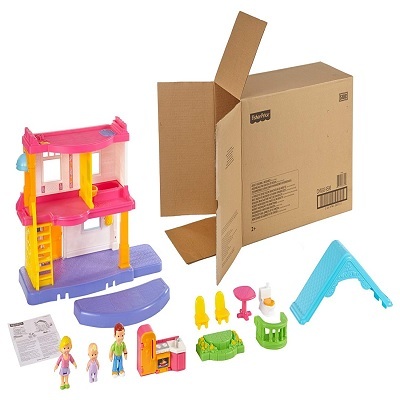 Interactive features like working lights, sounds, realistic features really make your kids feel like there is a world of possibilities when playing with this doll house. With three floors of fun, a modern entry way, an interactive kitchen, and walk-in closet the dolls or the kids will not ever want to leave. Opening the world of imagination and creativity is a real thing with this doll house. It gives kids all the tools and open space to walk through a day in the life of their doll. They will be able to learn and imagine by interacting with this doll house and dolls. It is a positive way to promote creativity and spark their imaginations. 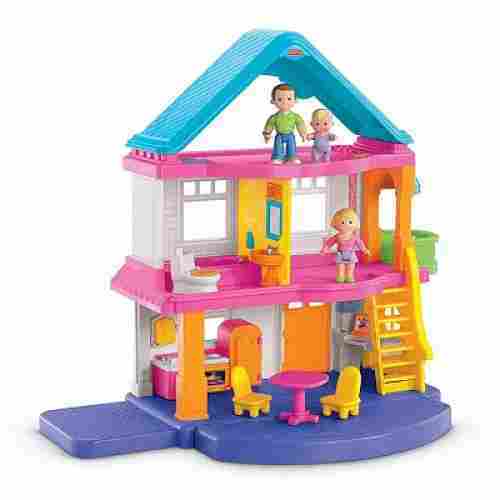 The sights, sounds, and interactive features that this doll house offers have the kids laughing and playing for hours. Window in the garage turns into a swimming pool that can actually hold water. The kids just love this. Dollhouses are a perfect tool for you to not only teach them the names and functions of the various furnishings and rooms in your home but also to teach them some of the proper etiquette and arrangement involved with domestic living. Teach them how to keep their own room clean through the example of the dollhouse, and teach them how to interact with their friends and family members in the context of the home. When we chose our products, we made sure to select quality products from trustworthy producers of toys. 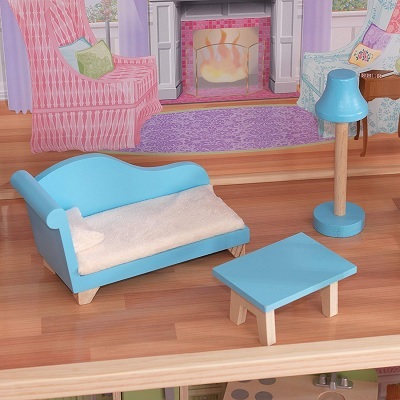 While some of these dollhouses may include pieces and parts not safe for toddlers, we did our best to add in friendly alternatives for that first dollhouse for your daughter. But the larger dollhouses are all composed of sturdy materials and nontoxic materials, making them safe for your children and your home indefinitely. The burgeoning creativity of your child is a wonder to behold, and toys are the immediately available resource to them in expanding their imagination and gaining a greater understanding of the world in which they live. Dollhouses are a prime option for young girls, as they often are more interested in the compassionate social tasks surrounding home life. 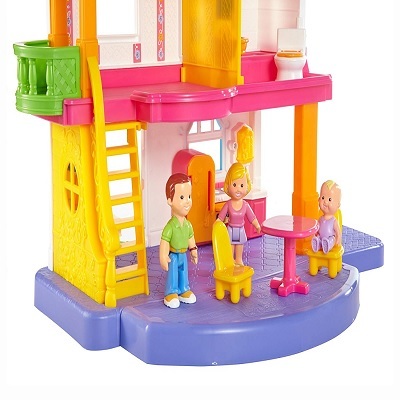 With these dollhouses, they can arrange and decorate their own rooms, wash pets and babies, or play house with their friends, learning important things about life all the while. With the development of your child’s creativity and intelligence, there will also come the responsibilities and difficulties of social interaction. She will need to learn how to have positive social interactions and how to maintain control of situations, and you can use dolls and playhouses to educate them on how best to do this. Your child is a sponge for information, names, and faces, and she’ll want to know the best ways to make friends and keep them in her future. 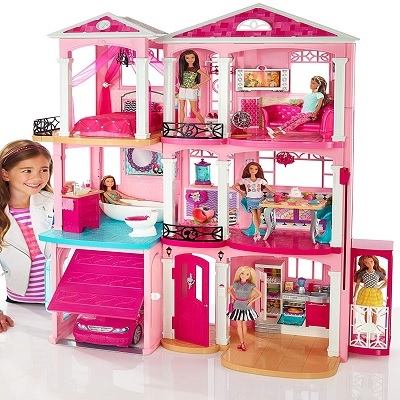 The controlled environment of the dollhouse within your home can help you to educate her, as well as let her loose with her friends for free play. Dollhouses are not only attractive to young children, but they are also didactic and useful for developing friendships as they expand their network of friends. A dollhouse is a small place for experiments in the larger world for them, a way to play out certain decisions and observe the consequences, without some of the social stigmas. They can voice opinions in the character of their doll, and they can see how their friends’ characters respond to the opinion. Play time is useful for you and your child in this way, allowing them to observe and remark on what they see in the world in a safe context. The imagination of a young child is an impressive and even formidable force for you as a parent: you are constantly finding yourself trying to keep up with the expansion in the mind of your child, constantly trying to find ways to improve and accelerate this growth. Children often use toys to impersonate us as their parents, often take on an impression of our roles around the home in their free play alone and with others. Knowing this, a child’s fascination with a dollhouse should be no surprising thing; the miniature home offers them a space to operate with the sort of authority and autonomy that they observe in you. It is important to teach them healthy ways to exercise and explore this authority over the world around them, how to take control of their situation without oppressing or annoying their peers. q: My daughter is 13 and she still likes playing with her dolls and dollhouse. At what age does playing with dollhouses become inappropriate? Frankly, as long as the play time isn’t impending in her life in a serious way, she can play with dolls for as long as she likes. 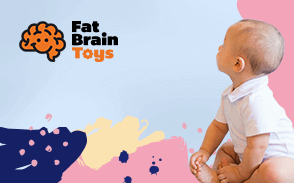 Typically, companies put a cap on the age range (like 3 to 7 years) because it’s at the latter age that children tend to lose interest in the toy. But if your daughter is in her teens and still finds dolls and dollhouses enjoyable, then that’s completely fine. However, if the dolls are affecting her life in a negative way, like she won’t socialize with other teens because of it, then you might have to intervene. This might just be typical teenage rebellion and anti-socializing tendencies, but it might also be a sign of depression or trauma. Just keep an eye on her, and if everything is going smoothly, then it’s perfectly fine that she plays with dollhouses and dolls. q: My son wants to play with dolls and dollhouses. Should I stop him, or try to steer him towards more masculine toys? 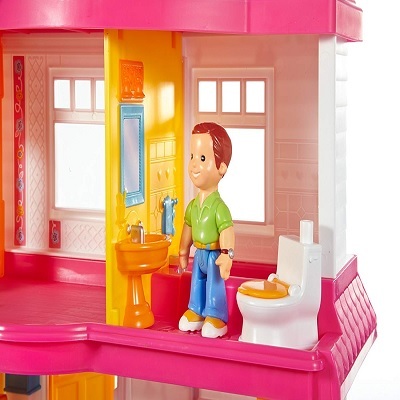 If your son wants to play will dolls, dollhouses, and more feminine toys, let him. There is no evidence or proof that boys playing with girl toys negatively affects their development or growth. In fact, when you let children play with the toys they want, they become more independent and have improved social skills because they feel more comfortable in expressing themselves to others. So, no, you should not be concerned with your son wanting to play with girl toys. If you’re uncomfortable, that’s completely okay. But as long as you put aside those negative feelings and understand that this will not hurt but benefit your child, you’re good to go. And to help with your discomfort, you could play with your son and see that this is just play time; it’s all fun and games! 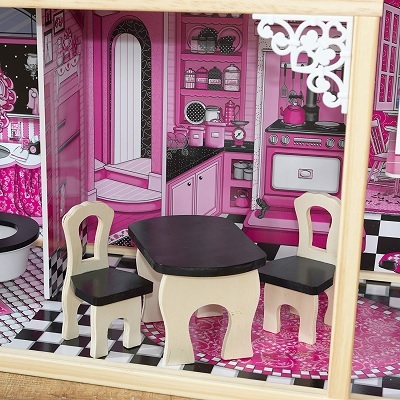 q: Can playing with dollhouses improve my child’s social skills? Yes! In fact, playing with dolls and dollhouses is one of the best ways to improve your child’s social skills. For example, if you plan a play date for your child and another child, incorporating the dollhouse gives both a chance to exercise their creativity together. They can either independently create something, like a storyline or a fantasy world with their dolls, or they can create something together. This not only helps their creativity, but also their teamwork and cooperation skills. And by having the children collaborate together, they begin to form a close bond and create a friendship through this act. And that’s ultimately what we want to accomplish in cooperative play time, lifelong BFFs! q: Will playing with dollhouses improve my child’s cognitive skills? Playing with dollhouses and dolls can definitely improve your child’s cognitive abilities. Cognitive abilities can refer to memory, judgment, reasoning, and perception. Because of the way most dollhouses are sectioned, the child has to judge distance and depth. The dolls themselves help your child’s memory because, usually, children create characters out of their dolls and little stories to go along with them. Reasoning is typically for older children, but playing with dolls and dollhouses places your child in the mind space of the scenario they’ve created. This makes them look critically at situations they’ve imagined and make decisions based on the rules of their created world. But it’s not just dolls and dollhouses that help improve your child’s cognitive ability. Most acts of pretend play assist some aspect of cognitive development. So, if you’re ever concerned with your child’s cognitive progression, then incorporating pretend-based play time, like dollhouses, can greatly improve that portion of their skillset. q: What age is too young for playing with dollhouses? Under the age of 3 is typically too young for dollhouses. This is because the dollhouses usually come with smaller pieces that young children can choke on if they’re not careful. But, if a dollhouse has rather large pieces, ones that are child-proof, then they could play with the dollhouse in theory. Before purchasing anything for your child, look at the recommended age range and follow that guideline strictly. Now, you know your child very well, better than anyone else most likely. But the recommended age range is just for general safety measures and should be abided by to keep all parties safe. If there is no recommended age on the product, the manufacturer’s website will typically have that information. If you still can’t find the recommended age range, then you should not buy the product. A company that doesn’t put forth those safety measures should be avoided. 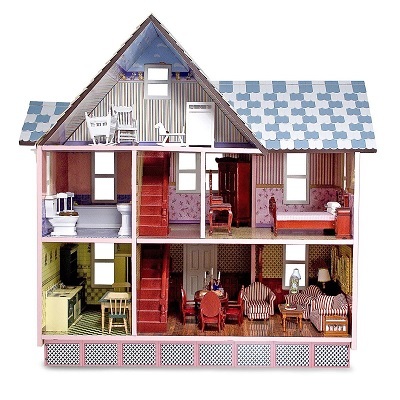 q: Can dollhouses help build my child’s creativity? Yes! 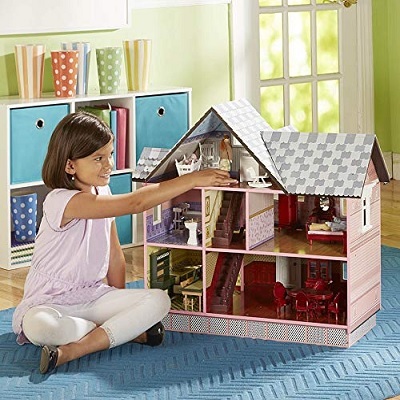 Dollhouses are great for building your child’s creativity and imagination. I would go as far to say that dollhouses are one of the best ways to instill creative and imaginative skills within your child in an engaging way. This is because dollhouses are so fun. All kids love to play dolls and action figures in some capacity, and dollhouses facilitate the fun and wonder of a child’s imagination. Dollhouses allow not only for the child’s imagination to flourish, but also to envision themselves in the situations they create. Practices like this are great for future communication and socializing with other children. It also gives them the opportunity to escape the world for a minute and gather themselves in their own little world. So, while dollhouses and playing with dolls give children a lot of creativity, it also allows the child to be creative on their own. And that’s the most important part of these kinds of toys. They actively build your child’s imagination while also giving them the ability to be themselves. q: My young daughter, age 3, likes to play with her big sister all the time. 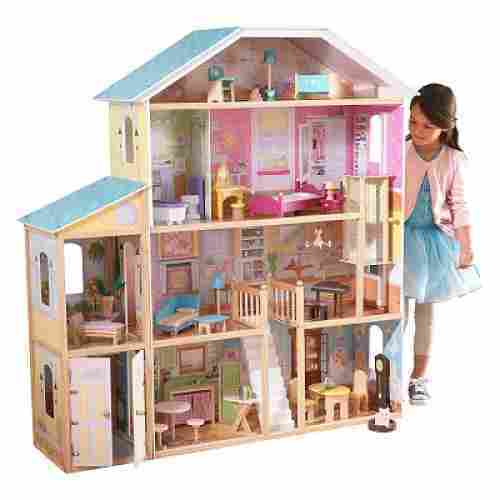 My oldest daughter wants a dollhouse for her birthday, but I’m very concerned about purchasing it because of all the little pieces. How can I keep my children safe and happy? Oh, this is a tricky one! Lots of parents face this issue, and I can see the dilemma. While you want both of your children to play together and grow closer, you also want to keep them both safe. The best advice I can give is just to be there while your children play. Keep a watchful eye on both of them, and if you’re older daughter is old enough, have her also look out for her younger sister. Don’t put all the responsibility on her, but try to instill a sense of duty and protectiveness towards her little sister. And if the little sister is old enough, teach her how to properly play with small toys. Also, teach both your daughters how to deal with broken or damaged toys. If a toy breaks into many pieces, they should immediately tell an adult and be careful of the area as to not injure themselves. 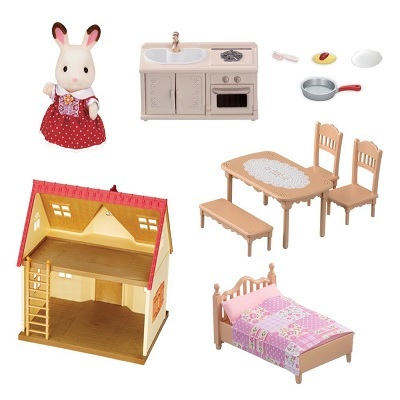 q: What materials are dollhouses and doll furniture usually made of? Usually, dollhouses and doll furniture are made of treated wood or of a plastic compound. Both materials are great options, and choosing between either comes down to aesthetics and pricing. A hand-carved dollhouse made of sturdy oak or birch will cost way more than a large, plastic dollhouse. The plastic dollhouses are just as durable as the wooden dollhouses, usually, and they are often safer. This is because the plastic dollhouses aren’t as likely to break or splinter. But plastic dollhouses do, at times, lack the charm and character of a wooden dollhouse. So, if you’re trying to decide between materials, shop around and pay special attention to price and atmosphere. And, the most important factor, see which one your child gravitates toward. Children, even at the age of 4, are already forming their own style and know very well what they like. So, whether you choose a plastic dollhouse or a wooden one, know both materials have their ups and downs. It all depends on the individual, and of course, what the little ones’ love! 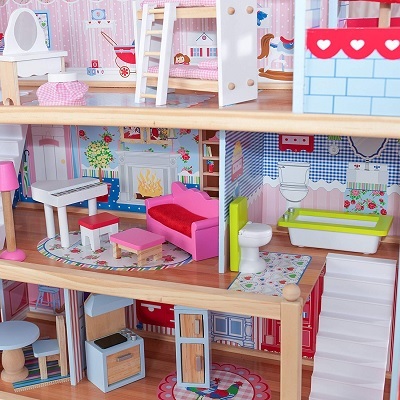 q: How can I keep my child’s dollhouse clean and orderly? If you’re referring towards to outside appearances, like scuff marks or dirt, then you first need to identify what the dollhouse is made of. Usually, the manufacturer’s website has not only the materials but also tips and tricks on how to best clean the dollhouse. If you can’t find that information, a good rule of thumb is to clean the house with warm water and a gentle cleaning solution. But, if you’re referring to the pieces in the dollhouse and how to teach your child to properly pick up after themselves, that’s a whole other beast. The best option is this situation is to make a game out of it. Act as if the dolls want to have their house clean and spiffy. This incentivizes the child to clean up themselves to keep their dolls happy. If your child is a bit too old for that technique, then they’re usually old enough to listen to reason. Simply talk with your child, and maybe set up rules and consequences for playtime etiquette. 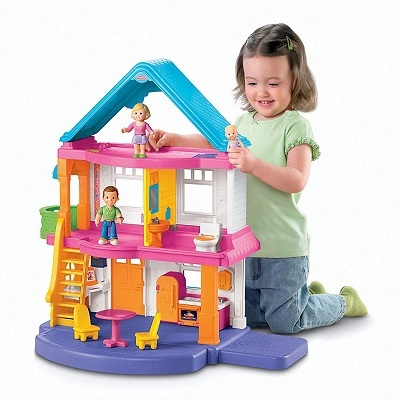 q: What fun, educational games or activities can I incorporate with my child’s dollhouse during playtime? Playing with a dollhouse and dolls can already be a very fun and educational experience. If your child is 9 or younger, then playing with a dollhouse contributes to both their imagination and their communication skills. This is because of the act of playing with dolls in an environment that your child controls gives them practice in social situations. For example, your child probably makes their friends or family members. They then re-enact certain social situations such as playing games or having conversations. This re-enactment gives them not only practice for these situations in real life, but also the opportunity to craft an appropriate response. One thing you can do is use doll time as a way to teach your child about stranger danger. Set up the situation and then show your child the correct response towards strangers. This is both fun and educational, and it also gives you the opportunity to play with your child in their own environment. q: My child doesn’t show interest in dollhouses or pretend playtime. Should I be concerned by this? Well, it’s important to take into account your child’s age. If they are over the age of 12, then dollhouses might just be too young for them now. There’s nothing wrong with a child’s interests changing as they get older. In fact, the changes are often a sign of maturity and growth that should be rewarded. If your child is younger and doesn’t play with dollhouses, but still performs some type of imaginative play, then that’s also fine. The time to be concerned occurs when your child seems to never engage in pretend time or imaginative playtime. This could point to deeper issues such as autism or Asperger’s. Because children with these developmental conditions have a hard time defining things in non-literal terms, their social skills and educational development can be adversely affected. If you’re noticing a lack of creativity in your child along with other issues with socializing or communication, speak with your pediatrician on a possible diagnosis.